A million years ago, when I was a new, young, single homeowner, I only cared about flowers. Maybe it had something to do with a college boyfriend. You know the type—the one who sends red roses to say he's sorry. So, with my own tiny plot of land, I decided I'd no longer depend on some guy to deliver flowers to me. I, as an independent woman, would grow my own bouquets. Then life happened. Peter arrived on the scene, and I must say—he's a good flower giver. Kids magically appeared. New house, many projects, an obsessive interest in kitchen gardening consumed my time. We started businesses that needed attention. Somewhere along the way, I forgot about the promise I made as my young self. Yes, I still grew flowers. But I couldn't remember the last time I really enjoyed them. So today, as a way to reconnect with the pleasure of gardening, I'm announcing the Adolf family's Floral Friday. Each Friday, I'm going out to the garden to gather whatever is pretty. And then, to celebrate the beginning of the weekend, I'm making myself a bouquet. Today, as Kristen arrived home from school, she found me in the front yard, pondering where to begin. 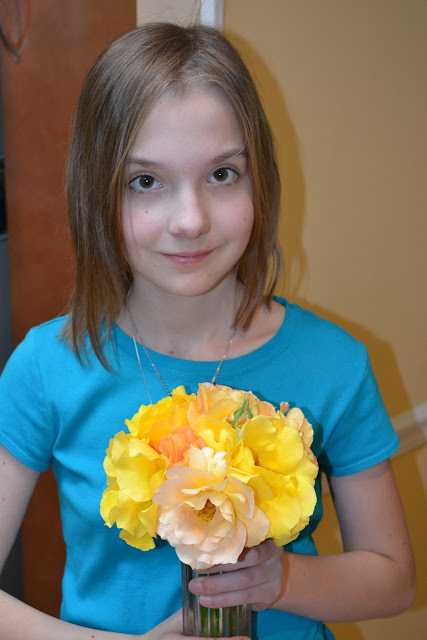 She quickly joined in the fun and made her own lovely bouquet! The yellow rose bush followed me from my old house, and I'm so glad it did. My mom, who passed away more than a year ago, gave me the rose bush. 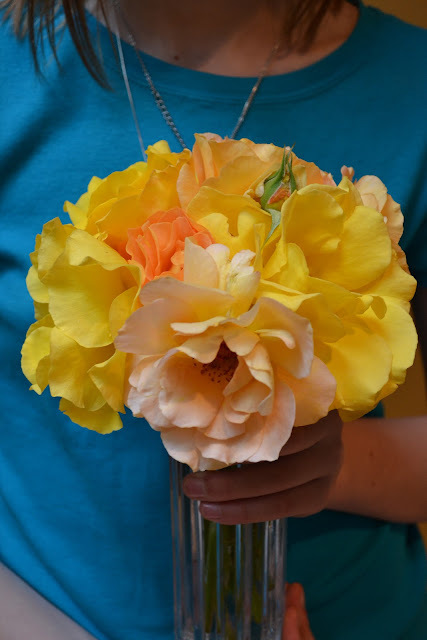 Now, the yellow roses grace her granddaughter's Floral Friday bouquet. , my favorite guilty-pleasure websites. Well, I'm not up to their standards, but I'll keep practicing! Hope you, too, take a moment and enjoy your own Floral Friday! My bouquet (with no Latin names or species, sorry) includes: peonies, gaura, lavender, yellow tea roses, honeysuckle, clematis, wisteria, irises, catmint, and lenten roses.